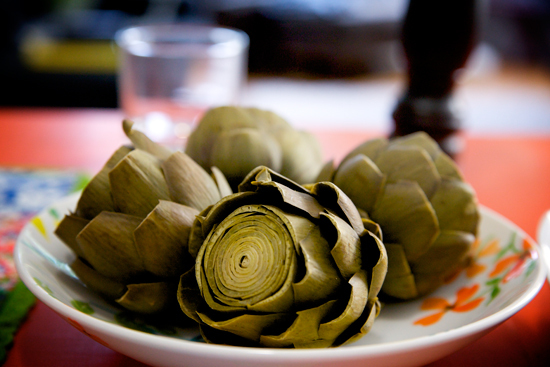 To prepare the artichoke, cut through the top half inch, and snip the tips of the surrounding and toughest leaves. Boil, 20 minutes or so. To prepare the mayonnaise, place a large egg yolk in a stainless steel mixing bowl or kitchen-aid mixer. Beat the yolk until it becomes lighter in color and appears tacky. Add a small spoonful of mustard (we used tarragon mustard) and a small squeeze of lemon (very very small) and mix well. Start adding oil, one drop at a time. You want the oil to appear completely incorporated before adding more, or else the mayonnaise may fail. We use 2/3 canola oil and 1/3 olive oil. Keep adding to the desired thickness. This mayonnaise will keep in a sealed container in the fridge for about a week.